We love pancakes at our house. As soon as my baby girl sees pancakes on the griddle she starts chanting, “Num, Num.” It about kills her to wait the 4-5 minutes for them to cook. Because we eat them so often, I try to mix things up and make different varieties during the week. I recently gave these a try and they’re a winner! The amazing thing is that you don’t add a lick of sugar! 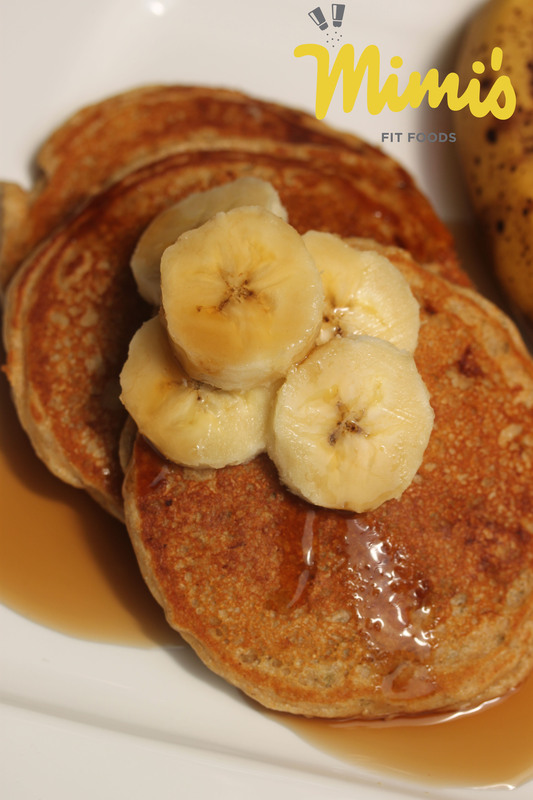 The mashed banana sweetens the pancakes perfectly. In addition, the banana flavor really does shine through on these. Another great health benefit is that these are very high in fiber, which also makes them very filling. I’ve created the recipe to fit a serving size where you can simply just eat the pancakes for breakfast. They have enough proteins, carbs (grains and fruits), and fats. However, if you prefer, you can always dial your serving size down to 2 pancakes and eat an egg too. We like to top our pancakes with sugar-free maple syrup (only 10-20ish extra calories). Bananas and maple flavor just go well together. That being said, I think they are good enough on their own. So, if you need a breakfast that you can grab and eat on your way out the door, these will certainly fit the bill. Here’s to another healthy, well-balanced, and tasty breakfast! Whisk together banana, vanilla, and milk. Set aside. In a separate bowl mix remaining dry ingredients. Incorporate the dry ingredients into the wet, mix until just combined. Melt coconut oil in a non-stick pan over medium heat, or use a griddle. Add a quarter cup of the batter to the pan/griddle. Flip once bubbles have formed and popped. Cook another 1-2 minutes or until pancake is cooked through. Repeat. Makes approximately 8 pancakes. If desired, top with fresh fruit and/or sugar-free maple syrup. *Other Nutritional Notes: If you get 8 pancakes out of your batter, each pancake is approximately 78 calories (4.4g protein, 15g carbs). Oh, I’m trying these FOR SURE! Sounds delicious! !